Work gets underway to remove courthouse oaks. Workmen are cutting down six century-old courthouse oaks today on the lawn of the Union County Courthouse in New Albany. The trees were planted when the courthouse was completed 109 years ago — June 1909. Workers with Zinzer Tree Service of New Albany are doing the work of cutting down the oak trees and removing the stumps. The Union County Board of Supervisors awarded the contract for the work to Zinzer at its June 4, 2018, meeting. Zinzer’s bid of $4,927.50 was the lowest of three bids received for the work, one of which was for $10,000. Consideration about what to do about the old trees started after a wind storm uprooted a 4-foot diameter tree at the northwest corner of the courthouse lawn on April 3rd. One other tree was so seriously damaged in the storm that it had to be taken down. 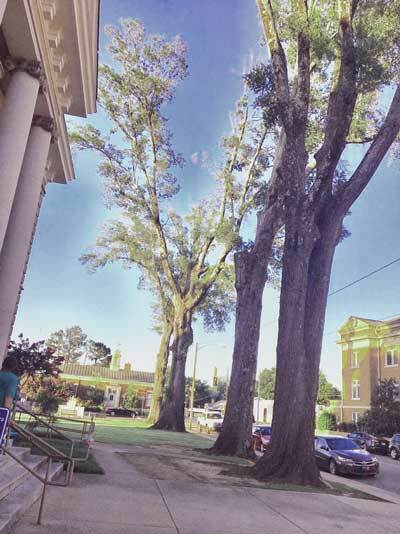 The board asked the forestry department of Mississippi State University for advice regarding what to do about the six oak trees then remaining. Dr. John D. Kushla, a research professor on the Mississippi State forestry faculty, came to New Albany and examined the six remaining trees. Kushla advised the supervisors that four of the six trees were hollow and dangerous and needed to be cut down right away. Kushla said that the other two trees might survive for another year or so but were near the end of their life expectancy. The board voted unanimously to cut down all six of the old trees. The board said it would have new trees planted at the courthouse when cooler weather arrives in the coming autumn. The photo gallery below shows the changes made in 24 hours, between 8PM on the 26th and 8PM on the 27th. The lone oak remaining in the last photo will be taken down on Thursday the 28th. 6-26-18 8PM. Old and unhealthy courthouse oaks to be taken down. 6-27-18 8PM. A very changed view in 24 hours. Waiting for new trees to be planted in the fall. I hope they will get someone to cut the trees into slices. They could be sold or just donated to be decorations.